Botanical Solutions by Alto Bella is a naturally derived line of haircare products that will reduce fadage caused by the sun. The innovative Botanical Solutions line contains Rhatany Root, a pure Botanical Extract with natural UV ray absorption properties. 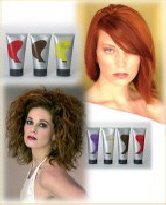 Botanical Solutions help retain haircolor tonality and control fadage without weighing the hair down. In our extensive clinical testing, real hair swatches treated with Botanical Solutions were left for seven to thirty days in direct sunlight of varying degrees and intensities in Arizona, Mexico and Minnesota. The results were dramatic. Color fadage of the hair treated with the Botanical Solutions styling products was greatly reduced, while the untreated hair had faded significantly. The innovative ClayPac® ClayOns® technology offers a new dimension in hair care treatment followed by an at home shampoo & moisturizer system. All products are specially designed with color to correct unwanted hair tones and prevent haircolor from fading without peroxide or ammonia. Now for the first time, you can control the condition and shine of the hair while maintaining haircolor tones. Style Essentials for the Artist in all of us. Curl Solutions by Alto Bella is an innovative product system designed to create smooth, shiny, frizz free hair. Using curl solutions as a system will result in frizz free healthy, manageable enviable curly hair. "Because your scalp goes everywhere your hair goes"
This two part system gives total care to hair and scalp when used together.These products are fragrance free.